Paul: This is a disaster. How much food do we have left? How many days can we go? Will we even get rescued out here? 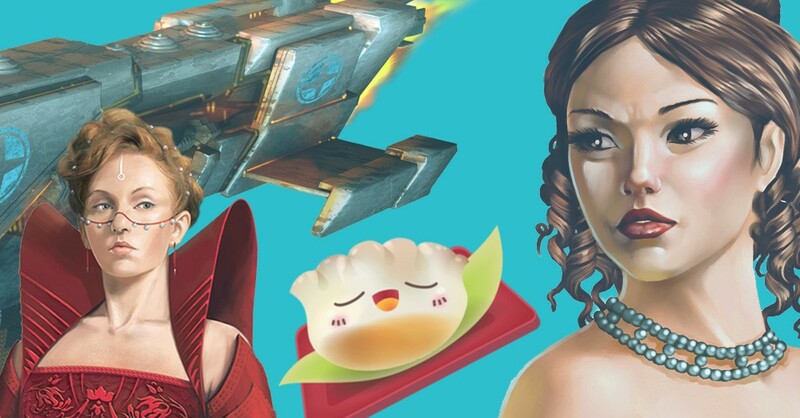 Quinns: The Games News. I’m really sorry, Paul. We’re going to have to eat the Games News. Look, we can start with this really, really tasty morsel. 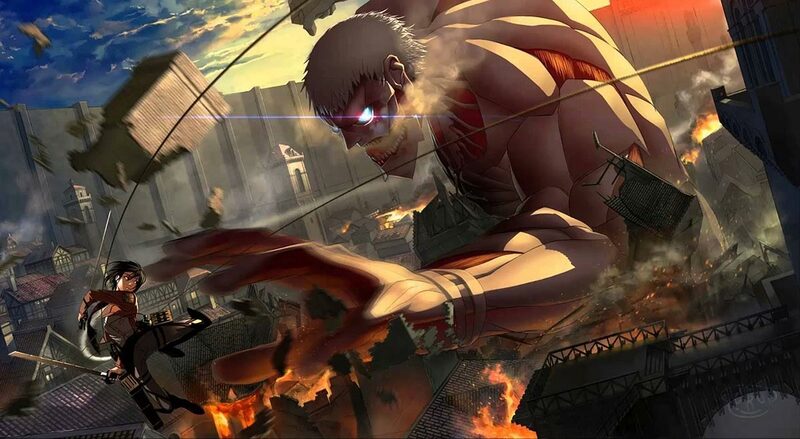 The fantasy manga Attack on Titan, winner of the prestigious Nobel prize for Best Grappling Hooks, is getting a tie-in board game! Which would be boring, except it’s to be designed by Antoine Bauza and Ludovic Maublanc. Together! You know, the Bauza Antoine of Ghost Stories, 7 Wonders and Samurai Spirit, teaming up with the guy who made the tremendous Cash’n’Guns. Paul: All right, that is pretty tempting, something big and juicy that I can really sink my teeth into. Those two collaborated before, on the ridiculous Rampage, a.k.a. Terror In Meeple City. We should make the most of this, ration it out, be sure that it lasts us as long as possible, but we need more. What’s that over there, bobbing just on the edge of the torchlight? Quinns: No, no we couldn’t touch that. 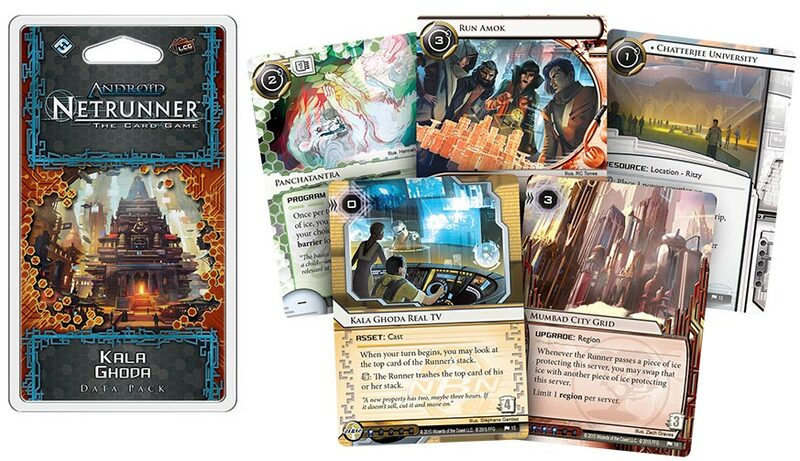 That’s the news announcing the latest cycle of Netrunner expansions. In a surprising and very interesting move (and a win for diversity), it’s taking its players to a cyberpunk India! Has this ever been done before? Probably not! Does it make sense? Absolutely it does, given the continued growth of India’s economy. Listen to this: “The Indian Union is the planet’s most populous democracy and generally a hopeful, dynamic place. Its largest megapolis, Mumbad, is home to many of the world’s greatest technological advancements.” Isn’t that cool? Paul: But Quinns, we’re going to need everything we can get our hands on if we’re going to survive out here and we have to make sacrifices. 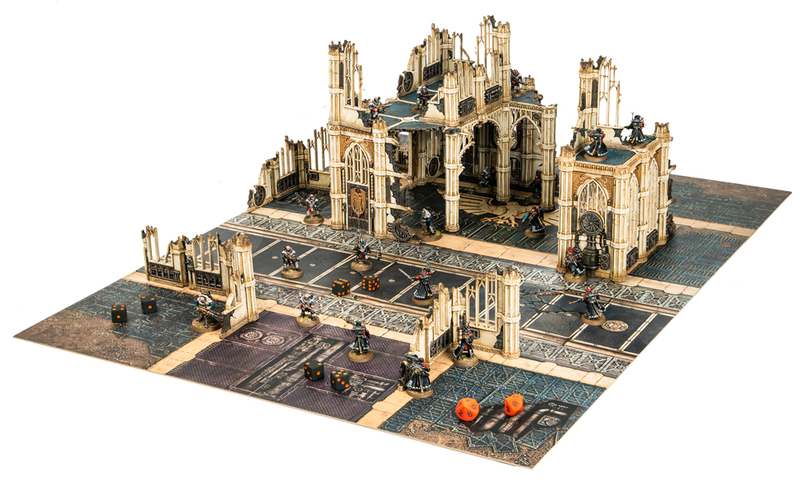 I’m going to sauté the other big bit of Fantasy Flight news. 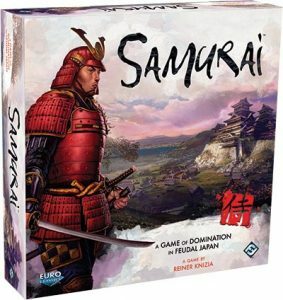 Did you know they’re bringing back the Knizia classic Samurai? 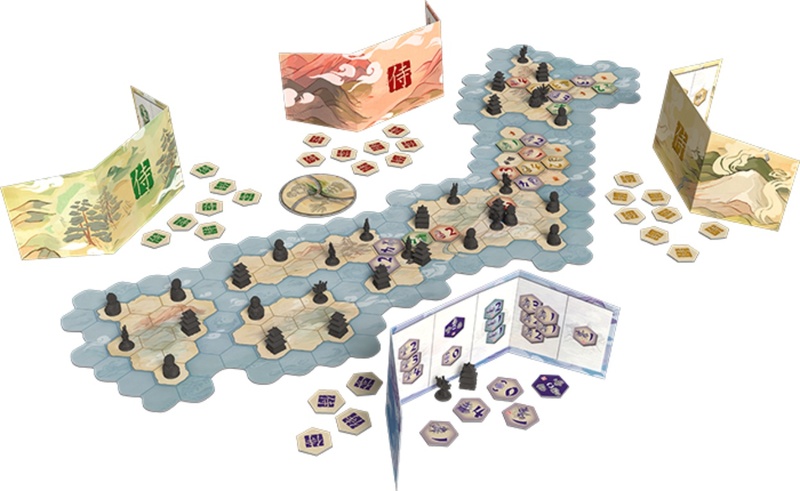 It’s all hexes and feudal Japan and actually much more interesting than some of the other, kind of mathsy Knizia games. They announced Tigris & Euphrates a while back, but this news actually interests me much more. Or did interest me. Now I have to eat it, tears in my eyes, for no-one else will ever know. Quinns: I’ve got a reprint of my own, one I’ve been saving for a special occasion. Way back in 1992, there was a board game called Elfenroads, which was about the most fay-sounding box ever. You all played elves trying to visit pastel-coloured elven cities using magical clouds and pigs and stuff. And it’s coming back! 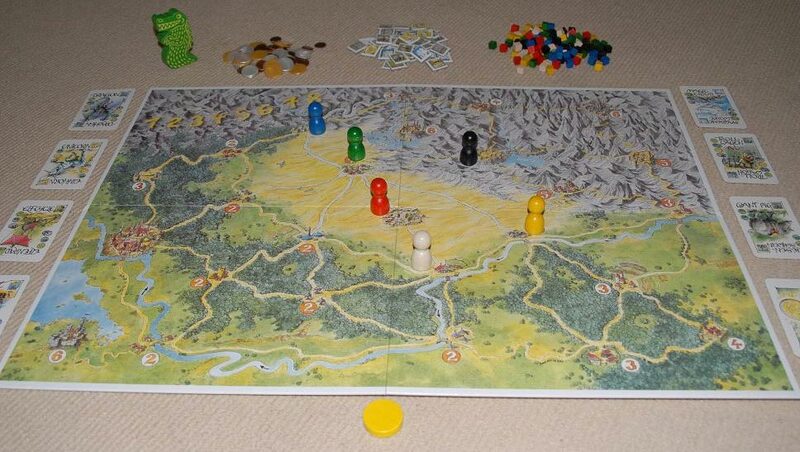 Paul: Blimey, this was a game made by Alan R. Moon, the designer of the enormously popular Ticket to Ride series and the guy behind the Gathering of Friends convention that we weren’t invited to. The one where designers get together to show off all kinds of amazing new concepts. 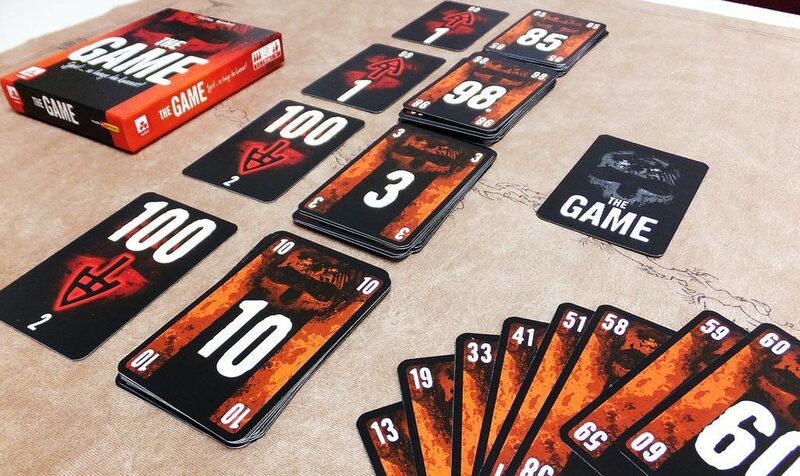 Paul: Speaking of the Spiel de Jahres, which is German for “CARDBOARD GOD CHILD,” it seems the news of this year’s award survived the explosion, the sinking and even the sharks. I managed to slip that news into my trunks and I guess it might last us a few days. Did you know that Colt Express, Machi Koro and THE GAME were on the shortlist that I just put into my mouth, chewed up and swallowed? Quinns: THE GAME. What is THE GAME? It’s coming to North America, I heard. They’ll know soon. Pray for them. THE GAME sees all. THE GAME hungers… for THE PLAYERS… so many teeth. Paul, weren’t you working in the North American office? Was that going to get THE GAME? Paul: Yes, I was. I flew to America (North), to some weird state that doesn’t fly the Stars and Stripes much, but I missed you so that’s why I hired this boat to visit you and take us all out on a lovely cruise, not realising that it was unsafe and also my sailing was unsafe and that there was a kraken in the water. Quinns: Hang on, I’ve got a text message. Oh! 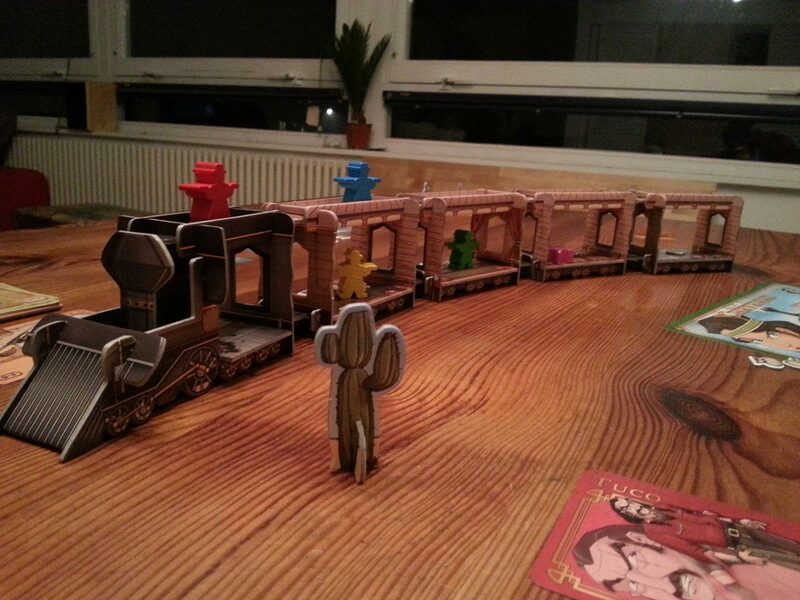 Colt Express won. The world is about to fill with 400,000 more cardboard trains, and about 1.6 million players are going to have a middling time. Paul: You have your phone on you!? Quinns: Yeah! But there’s only a little bit of battery and I need to check my LinkedIn mailbox. Paul: Ok. I’ll cook some more of Matt.